Two exhibitions and a public ‘witness seminar’ are to explore the threats facing the wrecks of military vessels as a result of illegal salvage and looting. Advances in technology have made it easier for unscrupulous salvors to take material from wrecks the world over. The legal protection of such underwater sites, which may lie thousands of miles from their country of origin, is fragmentary. But the wrecks, which may be the last resting place of large numbers of service personnel, are of huge historic and emotional significance to veterans, families and residents of the home ports and countries involved. Recent news stories reporting disturbance and theft from such sites have led to international outcry. 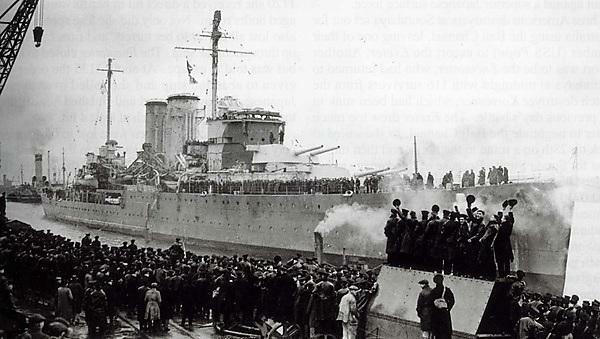 HMS Exeter was built in Devonport and launched in 1929, later returning to Plymouth in 1940 for repairs after being damaged in the Battle of the River Plate. The vessel was transferred to the Far East, where it was sunk in 1942 during the Battle of the Java Sea. Located in 2007, in 2016 divers discovered that the vast ship had almost completely disappeared from its resting place on the sea floor among the islands of Indonesia, along with other British, Dutch, American and Japanese vessels containing potentially hundreds of bodies. The discovery made international headlines bolstered by gruesome claims, now discredited, that the remains of service personnel had been brought to the surface and buried in shallow graves. Now researchers from the University of Plymouth’s School of Law, Criminology and Government are shining a light on the issue, and sharing their expertise with the public. Jason Lowther, Associate Professor of Law and Visiting Research Fellow Michael Williams are studying the problem with the archaeological charity the Maritime Archaeology Sea Trust (MAST), the Ministry of Defence (MoD) and the Museum of the Royal Navy to consider how best to protect these sites from looting and damage. The School is running an exhibition from Tuesday 23 October to Saturday 10 November, concurrently at Charlestown Shipwreck and Heritage Centre in Cornwall and at the Devonport Naval Heritage Centre in Plymouth. At the same time, an event on Wednesday 7 November from 2-4.30pm will bring together specialists from the University and further afield, and input from a public audience, to debate the issues and consider how Royal Navy maritime heritage can best be protected beyond UK territorial waters. The panel will include: Retired Vice Admiral Sir Anthony Dymock, a Trustee of MAST, which has a Memorandum of Understanding with the School of Law, Criminology and Government; Michael Williams; Dr Harry Bennett, Associate Professor in History, University of Plymouth; and Dave Parham, Associate Professor in Maritime Archaeology, University of Bournemouth. The events are taking place as part of the University’s Festival of Social Science 2018, itself part of the national Economic and Social Research Council (ESRC) festival. Book a place at the witness seminar. “HMS Exeter is just one of the wreck sites we will be focusing on in the exhibitions and witness seminar, along with what we can do, legally and collectively, to protect underwater cultural heritage. Technological advances like geofencing have given us new tools, but technology works both ways, allowing illegal salvors to pinpoint and access wrecks in a way they would not have been able to do 20 or even 10 years ago. “The international legal regime surrounding wrecks of warships is very complex and far from being settled. These sites are often referred to as ‘war graves’, and while that is not true in any official sense, there has always been a culture that the last known resting places of soldiers, sailors and airmen should be specially protected. More information on ESRC Festival of Social Science 2018 events at the University. 6 November: How Do You Fix A Town Like Plymouth?